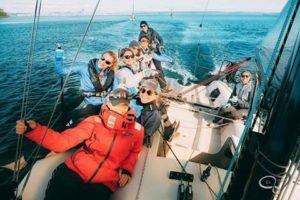 High winds, strong currents, dense fog and fierce competition: listen here as Bainbridge Islanders Jeanne Goussev, Haley Lhamon and Kelly Adamson share the amazing story of Team Sail Like a Girl’s successful bid to win the 2018 Race to Alaska, North America’s longest human and wind powered race. 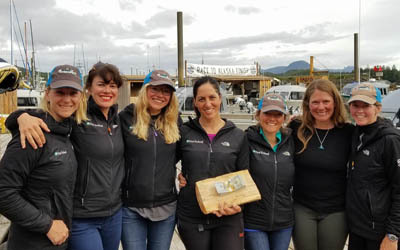 After sailing round the clock for 6 days, 13 hours, and 17 minutes with no outside support along a route that traces 750 miles of the famed Inside Passage, these intrepid women biked and sailed their single hull day-sailer to the Ketchikan finish line just after midnight on Sunday, June 24th, almost two hours ahead of the second place winners and beating out 35 other teams. 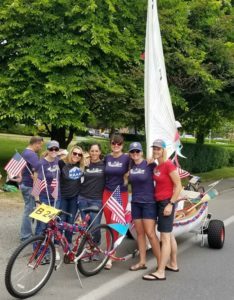 Though not the first all female team to enter the race, they are the first all-female team to win, and here they tell the tale of the extensive planning, devoted teamwork, and exceptional physical and mental endurance needed to win this grueling race… not to mention the encouragement of a magical pod of Orcas who showed up just when the women needed it most! Thanks to Aimee Fulwell, Jeanne Assael Goussev, Allison Dvaladze, Anna Stevens, Haley King Lhamon, Kate Hearsey McKay, Kelly Adamson Danielson, and Morgana Buell for encouraging women around the world to join in their spirit of adventure. Listen here and be inspired! Credits: BCB Host: Jo Jenkins; BCB audio tech, editor and publisher: Diane Walker.